I finally discovered a fitting blog title that I feel really good about! I resonate because I created this blog to reflect on my creative process and to invite others into my experience. I think a lot about vision and how they say artists are nothing without vision, which intimidates me whenever I remember that I don't know exactly where I am going. But my summer with 2100 Productions reminded me that it's the process that refines and defines. It's less about Doing than it is about Being. So I'll take that first step. And the next, and the next. This life therefore is not righteousness, but growth in righteousness; not health, but healing; not being, but becoming; not rest, but exercise. We are not yet what we shall be, but we are growing toward it. The process is not yet finished, but it is going on. This is not the end, but it is the road. All does not yet gleam in glory, but all is being purified." I actually learned vacilando from Lost In Translation, a beautiful book I recently bought (from Anthropologie, of all places). 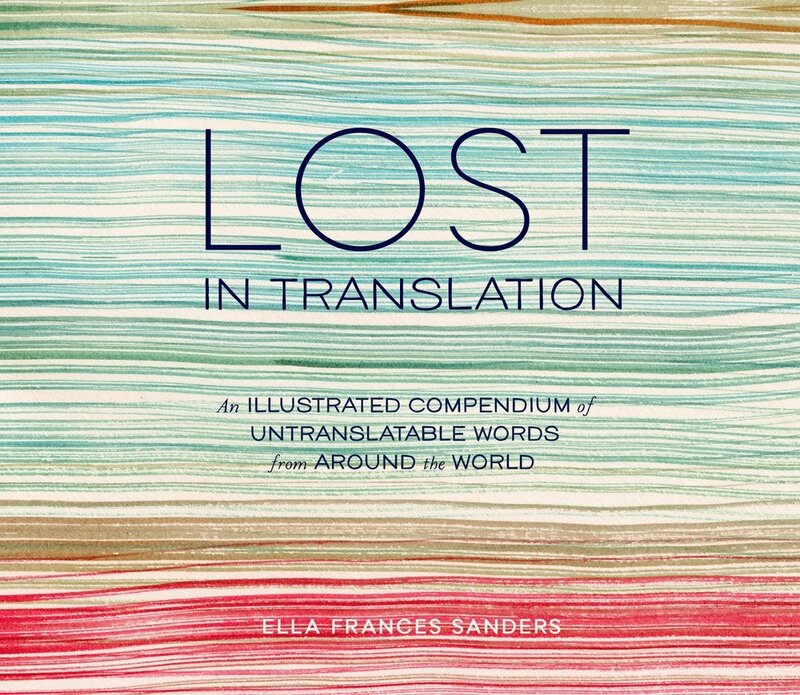 Written and illustrated by Ella Frances Sanders, it is a nifty compendium of words from languages all around the world that capture an emotion or experience that most of us can relate to, but cannot easily translate as an English word. It's an awesome conversation starter and the latest addition to my favorite books list. Language really does define the limits of our perceived reality, so this book has already expanded my grasp on life by giving me the vocabulary to communicate experiences that English just can't express. As much as we like to differentiate ourselves...we are all made of the same stuff. ...We meet people from places and cultures different from our own and yet somehow we understand the lives they are living. Language wraps its understanding and punctuation around us all, tempting us to cross boundaries and helping us to comprehend the impossibly difficult questions that life relentlessly throws at us. ...whether you speak a few words of one or a thousand words of many, they help to shape us - they give us the ability to voice an opinion, to express love or frustration, to change someone's mind. For me, making this book has been more than a creative process. It's caused me to look at human nature in an entirely new way, and I find myself recognizing these nouns, adjectives, and verbs in the people I walk by on the street. ...y ya! I'll just end with some of my favorite words from the book. They're my favorite for different reasons ranging from super poetic to super creative to super random to SUPER WAOW. Enjoy! Hearth / WELSH (noun) a homesickness for somewhere you cannot return to, the nostalgia and the grief for the last places of your past, places that never were **Heaven comes to mind - the home we long for, were created for, but have never been to. Drachenfutter / GERMAN (noun) literally, "dragon-fodder" - the gift a husband gives his wife when he's trying to make up for bad behavior ** This was the LOLest word in the book for me. I have so much appreciation now for the creativity of the German language. Mångata / SWEDISH (noun) the road-like reflection of the moon in the water ** I originally thought about using this word instead of vacilando. We are moons that reflect the Son, so our "road-like reflection in the water" is the lives we chart as lights in the world.